I'd agree with the fake assessment - back looks bad as does the hidden Mickey on the front. At the rate we are going, it'll be Christmas before we get these 2018 HMs!!! Some of the stitch have been faked. Easy to figure out when you look at the scrapper sellers selling them for cheap. "Spoke to cm, sounds like DLR 2018 HM are en route, and might appear in October. I add "might" cause that's what's been advised, but we've also been advised that WoE were coming back in August. At least this update sounds more promising, so fingers crossed we'll finally have some new HM excitement "
All I can say... here's hopin'! I hope you and Darice are right! I just got my AP, so I'm excited to hunt for my first round of HMs! chubs191, pincrazy and TheMickeyMouseRules like this. I will believe it when someone else sees it. And WDW already is getting their second round. We talked to the pin people during the event. Apparently, when the 2018 pins were originally ordered (and I assume a lot of other pins too), somehow the DLR HM set got missed by the vendor. So Disney didn't realize they hadn't REALLY been ordered until the WDW 2018 HM order arrived, and they were like, "Umm, where are the DLR pins." And it was like, "What DLR 2018 HM pins?" chubs191, pincrazy and watzshakinbacon like this. That is very curious. All the odd/conflicting info mostly makes me wonder what is really true. Thanks! Here's hopin' this time for reals. Can confirm the new hidden mickeys hit DL yesterday. Heard from more than one CM that they'd had them but were traded for immediately. Only saw on one CM lanyard, but yes they're here! Connies_Hobby, Hiddenmickey2018 and TheMickeyMouseRules like this. Per the CM's the day I was there earlier this week, they were traded for as soon as they put them on their lanyards. Otherwise I saw none of them either. As mentioned earlier the 2nd wave has arrived. The 1st wave of HMs are still a no show and no info, so i guess they are still a mystery. Good luck on finding these new ones! I was told the same thing from the 2 Cast Members manning the PIN Partners area for WDW/DLR who are also in Pin Development. They also disclosed the 4 Waves per year of HM Pins planned, starting in October. The 2018 Wave B pins for WDW should be showing at locations within the next few days. For my resort, however, you can start finding them tomorrow morning. TiggerSue, pincrazy, Haunted575 and 1 other person like this. 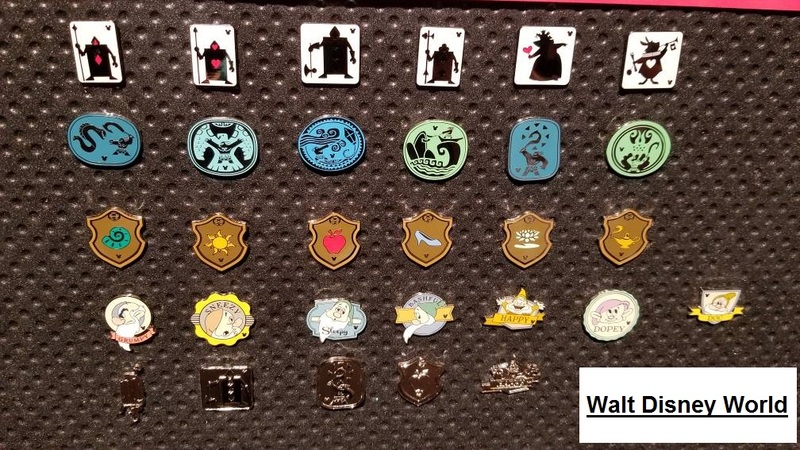 I forgot to mention, also, that unlike previous waves where there are six pins shown in a series but only five are released, this wave ALL of the shown pins I can confirm are part of the release. In fact, I am looking at all of the pins right now...they are pretty spiffy. Jabberwocky, bookhugger, Fins4pins and 1 other person like this. I’ll be in search of the AIW card set. My favorite character - White Rabbit - getting some ️! MommaIvy, Ajk and TheMickeyMouseRules like this. I feel the same way but must resist! !